The price of making a mobile call from abroad has just got cheaper as 3 announces that is scrapping roaming fees. There is increasing pressure from consumers and agencies such as the European Commission for other operators to reduce the costs involved in making cross-border mobile calls. But with operators unwilling to loosen their grip on what is a huge money-spinner, are there alternatives for consumers facing exorbitant bills at the end of a holiday? It is already possible to make calls from abroad a whole lot cheaper, argues the head of one alternative telephone service. Sample tariffs for a four-minute peak-time call in March 2006. Prices vary according to which UK network and host network are used. 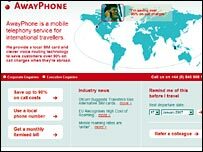 Mobile operators are currently just paying lip service to demand from their customers for cheap calls, thinks Sherry Madera, chief executive of AwayPhone. "Mobile operators simply aren't exploiting the technology that they have at their fingertips. It would be possible for them to offer people as much as 90% reductions," she said. The technology she is talking about is voice-over IP (VoIP), already making its mark in the world of fixed line telecoms, through companies like Skype, and ready to make an impact on the mobile world. Companies such as AwayPhone are already taking advantage of voice-over IP technology to drastically cut the cost of making calls from abroad. The AwayPhone service requires users to replace their existing SIM card with a card that routes calls over IP networks. In order to swap SIM cards, handsets need to be unlocked - a job mobile repair shops can do. Although the call costs will be dramatically reduced, the service isn't cheap. There is a one-off fee of £24.99 for the SIM card and a monthly subscription fee of £5.99. Services like AwayPhone are designed with business people, who are most hit by roaming costs, in mind. On the face of it, 3's decision to scrap roaming charges for voice and data offers good savings but there are caveats, said Ms Madera. "It relies on phones finding 3's network. Phones tend to seek out the best coverage and flick between networks. There is a tension between what the handset wants to do and what the operator wants but this is a moot point to the person standing at a foreign airport and wanting to make a call," she said. If operators have been reluctant to let go of the revenue they make from roaming, they will be even more reluctant to embrace VoIP, she said. "They will give up their stranglehold kicking and screaming," she said. The same was said of telcos but in fact they have incorporated VoIP technology into their networks without compromising their revenues. John Delaney, principal analyst at research firm Ovum, thinks mobile operators will eventually do the same. "VoIP over mobile is still a tricky proposition without compromising on quality but as operators upgrade to 3G networks mobile operators will develop their own VoIP services," he said. This will drastically reduce network costs for operators, and make for an altogether smarter mobile network, both of which will eventually benefit consumers. "The potential is there to offer cleverer services such as being able to add and drop participants during a call or add a video component," he said. According to a survey commissioned by the European Commission, calls to a mobile in another country within the EU can be as much as four times higher than a call within the same country. It estimates that currently European mobile phone operators make £5.7bn a year from roaming fees and is looking to introduce legislation to slash this by as much as 70%. Mr Delaney thinks the European Commission will continue to exert "downward pressure" but he doesn't foresee the abolition of roaming fees any time soon. Neither does he think other operators will follow in 3's footsteps. "3 has a somewhat different agenda. The bigger operators make a lot of money out of it," he said. Movements towards lowering costs are happening - both Vodafone and 02 offer customers reduced roaming rates if they use their networks abroad - but 3 is the first to scrap the charges completely. While consumers wait for others to follow suit, UK regulator Ofcom offers some tips for making mobile calls abroad. As well as swapping a UK SIM card for a local one purchased in the country being visited, it also suggests using local payphones, buying a different mobile phone locally or sending text messages instead of making calls. For many though, concerns about the high cost of making calls from abroad means at the moment there is only one real alternative - switching the phone off completely.